1. To take without authorization, often with force: The duke tried to usurp or to take over the throne of the king. 2. To take over or to occupy without the right to do it: Rufus made an effort to usurp his neighbor's land by claiming it actually belonged to him. 3. To wrongfully seize another's place, authority, or possession: Little by little, the assistant, Mr. Carter, started to usurp his boss's authority. 4. To use without authority or right; employ wrongfully: The magazine usurped copyrighted material for the article. 5. 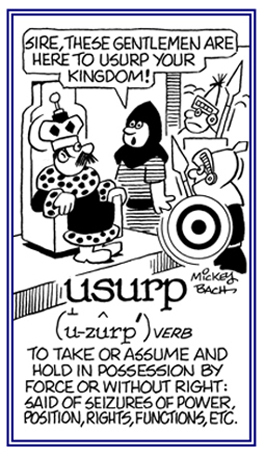 Etymology: from Latin usurpare, "to get possession of, to acquire"; from usus, "use" and rapere, "to seize" (usu-rapos); then through Middle French usurper and via Middle English usurpen. © ALL rights are reserved. 1. Illegally appropriating and holding an office or powers by force: The military usurpation of the throne of the king resulted in a different form of supreme authority. 2. Entry to another person's property without a legal right or permission: The usurpation of the demonstrators into the shopping center created all kinds of havoc or disruptions for the stores and the shoppers. 3. The seizure or the exercise of authority or possession of something wrongfully: The newspapers accused some city council members of a usurpation of the mayor's governing powers. Unlawful or unwarranted encroachment, infringement, or apprehension: The usurpatory behavior of the police against the student demonstrators resulted in strong condemnations by both students and the media that covered the pepper spraying actions. 1. 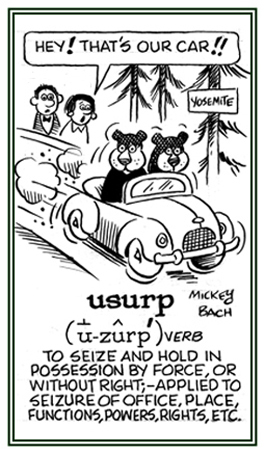 A person who, in violation of law or illicitly, takes over another's place, jurisdiction, or possessions unjustly: The usurpers treated the foreign visitors in a manner that was contrary to decent behavior. 2. 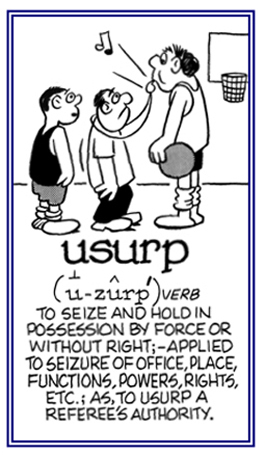 Those who take control of a position of power; especially, those who do not have the right to such control or power: The newspaper described the usurpers as individuals who obtained and maintained authority over the neighborhood by force without any legal authority. There were many usurpers in the late Roman Empire; especially, from the so-called crisis of the third century onwards, when political instability became very common. A reference to appropriating another's place, authority, or personal effects illegitimately: Government regulators criticized the mortgage-servicing industry for usurpingly foreclosing on U.S. homeowners. The bank was accused of usurpingly taking the Swift's house before they had a chance to make the late payment. 1. The practice of lending money and charging the borrower very high interest rates: Joan's husband was accused of a criminal act of usuary because he was charging an unlawfully high rate of interest when he loaned money to his fellow workers. When Maggie tried to borrow some money to pay her medical bills, she went to a local loan agency and when she was told how much interest she would have to pay, she told the dealer that he said the rates he was charging were "fair", but she said his required payment was bordering on usury! 2. 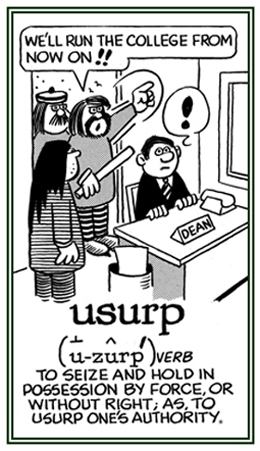 Etymology: from Anglo-Norman usurie; from Medieval Latin usuria, an alteration of classical Latin usura, "use of money lent"; hence, "interest". 1. To make use of or to put something into practical use: Mable utilizes the most nourishing foods when cooking. 2. 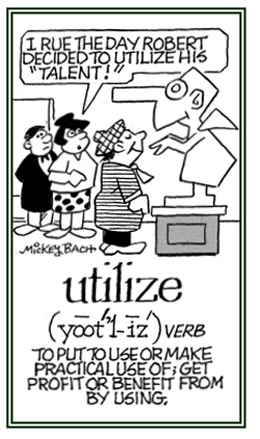 Etymology: from Latin utilis, "usable" from uti "make use of, profit by, take advantage of." © ALL rights are reserved.